In association with The MAC, Belfast. A new exhibition exploring the relationship between art and comedy is to open (Saturday 9 April – Sunday 19 June 2016) at Bluecoat, Liverpool’s centre for the contemporary arts. Double Act: Art and Comedy draws together the work of 16 international artists who use a variety of media to communicate their differing approaches to comedy, ranging from the bodily humour of slapstick to more conceptual articulations of wit. 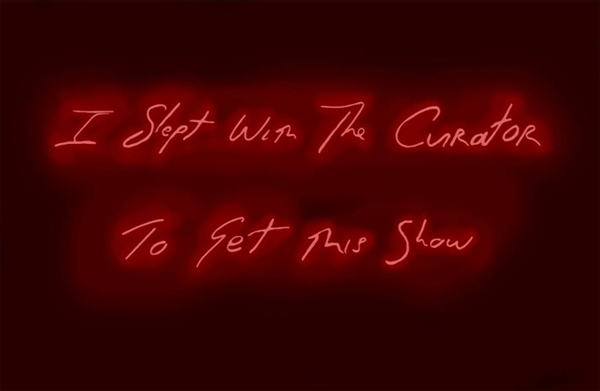 Maurice Doherty’s neon sign spells out the phrase ‘I slept with the curator to get this show’, using humour to undermine the assumed impartialities that lie behind curators’ choices to show some artists rather than others. The piece has been specially commissioned for the exhibition. 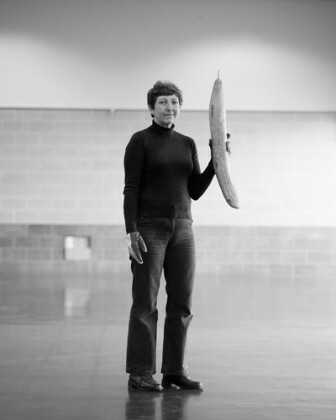 Other works include Gemma Marmalade’s photographs from her 2015 Seed Series (Green-Fingered), which give a new twist to the well-used joke of funny-looking vegetables by suggesting a relationship between female gardeners’ sexuality and the size of their crop. Erica Eyres’s drawings based upon photographs in nudist magazines, dating from the 1970s, rely on the comedy of the body and anxieties about nakedness. The exhibition examines how comedy goes far beyond the business of making us laugh: it has long been a powerful tool for social change and a means of undermining authority. What we find funny can also be cruel, establishing symbolic boundaries that divide people, setting those with power against those without and vice-versa. Double Act: Art and Comedy is curated by artists David Campbell and Mark Durden, founding members of the artists’ group Common Culture and studio holders at Bluecoat. The project stems from explorations in their own work of the comedic impulse within contemporary British culture. Marie-Anne McQuay, Head of Programme at Bluecoat, said, “Double Act: Art and Comedy explores the use of comedic devices – satire, slapstick, deadpan – from the perspective of artist curators and their peers. Bluecoat is delighted to support Campbell and Durden in realising this ambitious dual site exhibition. To explore its theme of duality, the exhibition will itself be a ‘double act’ and will take place at two venues; Bluecoat, Liverpool and The MAC, Belfast. Each exhibition has overlapping artists yet will display different works examining the theme of comedy. The one exception is Maurice Doherty, whose neon sign spelling out the phrase “I slept with the curator to get this show” has been commissioned by both venues. Double Act: Art and Comedy will run at Bluecoat from Saturday 9 April – Sunday 19 June, and at The MAC, Belfast from Friday 6 May – Sunday 31 July. Artists featuring in the exhibition at The MAC include Bas Jan Ader, Cory Archangel, Terry Atkinson, Mel Brimfield, Common Culture, Keith Coventry, Maurice Doherty, Richard Hughes, Paul McCarthy, Jonathan Monk, Adrian Paci, Julian Rosefeldt, Joachim Schmid, John Smith, Michael Smith, Richard Wentworth, Olav Westphalen, Erwin Wurm. A new wave of stand-up comedians representing the Arab world is arriving on the Liverpool comedy scene. The headliners are high-energy, affable Welsh-Egyptian comedian Omar Hamdi and British Nigerian stand-up and actor Nabil Abdulrashid. Arabs Are Not Funny will be hosted by Tunisian comedian Marouen Mraihi. Presented by Liverpool Arab Arts Festival. Poet Steve Ely and visual artist and writer Samuel Hasler mine a rich vein of dark comedy in an evening of readings in which error, misfortune and misadventure all feature. What’s there to laugh about? Questioning how humour is currently used in performance making, presenting and programming. A lively day-long symposium in collaboration with PANDA and Physical Fest. Tickets £40 for organizations / £20 for artists and freelancers / Book by 1 May and receive a £10 discount / £10 PANDA members.